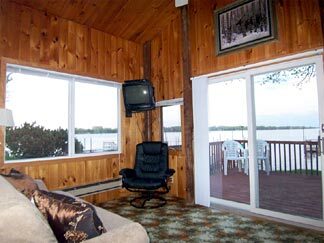 Cabins - Lakeshore Resort - Lakeshore Resort on Lake Osakis is peacefully located at the end of a 1/4 mile long private drive on a peninsula with lake on 3 sides. 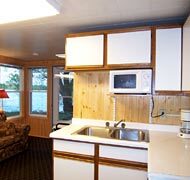 All cabins are close to the water and on level grounds. All 11 cabins have . 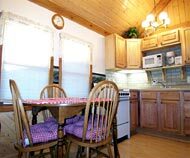 . .
Our cabins are exceptionally clean, well cared for, nicely furnished and decorated for a comfortable vacation. We put "your" dollars back into the resort improving and continuously upgrading. We furnish everything needed for housekeeping including a toaster, microwave, coffee pot, dishes, silverware, cookware, bed linens, blankets, and toilet tissue. Please bring your own towels and soap. Each additional person is $125/week, or $25/night. Under age 3 - no charge. Our fishing docks are only available to our overnight guests. A deposit is required within 7 days of making your reservation. A confirmation will be mailed to you. Upon arrival, guests are responsible for the full term of an accepted reservation. Balance on check-in. Cancellations: Please notify us as soon as possible if it's necessary to cancel. Deposits are refunded after reservation dates expire (less $25) if unit is re-rented for the same base price. Check in 3:30 p.m. · Check out 9:00 a.m.
Deposit of $150 for nightly rates.